Lousay Aubé, 74, grew up in Meaux on the same land where he lives now with his wife,the former Betty Melebech. He is a retired teacher and holds a master's degree in education, but he is also a traiteur, carrying on the ancient French Acadian folk tradition of treating common ailments through prayer and, in some treatments, the laying on of hands. In the past, these treatments substituted for the treatments of trained physicians in remote rural areas of Acadiana, but Aubé would never now suggest that people stop seeing their doctor for medical problems. Aubé considers his healing abilities a gift from God, and therefore refuses to accept payment in exchange for his services. Aubé's standard treatment, whether for warts, sinus trouble, shingles, sleeplessness, snakebite, bad dreams or a broken heart, is to repeat a prayer in French, usually silently, sometimes while making the sign of the cross over the area of discomfort. Since the treatment is a form of prayer, a traiteur does not have to be in the presence of the one being treated. Treatments can and often are given over the phone. The traiteur’s art is accepted by the Catholic Church, as long as the treatments remain in a religious context. Aubé treated Father Floyd Calais, who founded St. Theresa's in Abbeville, and his sinus problems were alleviated. 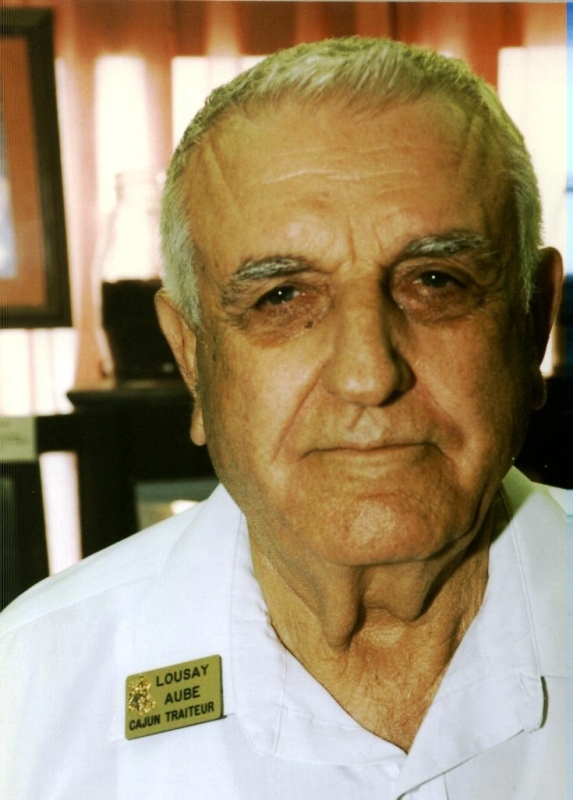 Lousay had wanted to be a traiteur since he was 10 years old. His great-grandfather, Nicolas Hebert and a cousin, Otis Mire had been traiteurs, but both died without passing on the treatments that they possessed for certain ailments, because once this is done, the traiteur can no longer treat for those ailments. The gift is lost, Lousay explains, and healers don't want to lose that power. Traiteurism is a very old tradition that is dying out, and very few traiteurs now exist. A young boy gave Aubé the treatment for warts. "He didn't want it, so he gave it to me. I tried it on another boy who had warts, and the warts disappeared within two weeks, so I knew I had the power. I picked up more treatments from there." Renee Adams of Kaplan gave Aubé some treatments she was ready to pass on, then a Mrs. Roddy from Abbeville gave him others just before she died, Aube said, all in French, "including one that she said was good for everything. She said she'd performed miracles with it. It's a good one." Aubé abides by the tradition of not accepting pay or advertising his services. "If I charged $5 a treatment, I'd be rich," he said. A person being treated is also not supposed to thank the traiteur, but leaving a small gift or donation is acceptable. He often comes home to find gifts, vegetables, a ham, some pralines, etc., under his carport. "I've been wanting to put up a little collection box to help me pay for my long distance calls to treat people, but Betty won't let me. I keep looking for a treatment for a woman's stubbornness, but I haven't found one yet," he laughed.